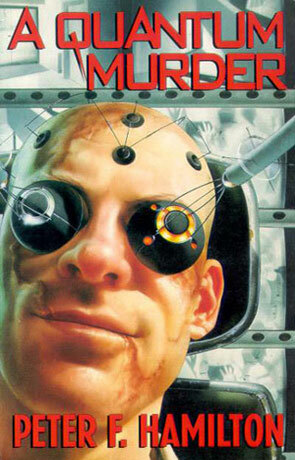 A Quantum Murder is the second volume in the Greg Mandel Trilogy by Peter F Hamilton. As good a read as the other two Mandel books, except for one big problem. As it often is with these types of 'who did it' stories, you will find clues scattered around the book as to what is going on, the reader's job is to evaluate these clues and try to out guess the detective (and the author). Sometimes these clues can be evaluated based on other clues, but sometimes you'll have to evaluate it on a silliness factor, i.e. if this is the main clue to the mystery the whole story becomes silly. You probably already knew this, I'm only saying it because the main clue as to who did it in this book had my silliness filter react quite strongly. I was actually thinking something along the lines of 'if this is it I'm going to be very disappointed'. Well it was, and not only that, but another silliness was added on top of it in the end. Disappointing. It didn't totally ruin the book and I'll still recommend it as a good read, but I still wonder what went wrong, Hamilton is usually better than that.